If you are looking for great induction cooking on the road or need a portable induction ‘starter package,’ the The Portable Induction Cooktop NuWave PIC Flex Starter Set delivers the ‘get up and go’ portability you’re looking for along with some solid cookware. You have everything you need with this set: a NuWave induction cooktop with one a cooking panel and 3 pieces of cookware with a solid lid, steamer, and accessories. 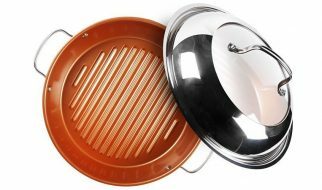 If you don’t have the time to look for specialized induction pans and pots or you are just looking for a package that will see you through as you move residences, you might want to take a long hard look at this cookware package. To size up this package’s feasibility, we reviewed its special features, overall long-term value proposition, versatility of use, how easy it is to use, its ease of maintenance and cleanup, and how likely it can withstand the test of time. Whether you are a college student moving in to your first apartment or are a couple moving from city to city due to employment reasons or anyone else needing portability and flexibility, this set has you in mind. You get a one unit induction cooktop that is very easy to use and has a compact footprint. Just plug it in and pick one of the cookware it ships with so you can start cooking. Quick and easy. 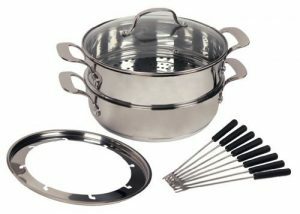 What’s extra special about this unit is that it ships with items that make certain dishes easy to cook like fondue. Imagine fondue on the road? All the cookware that comes with this package are optimized for the NuWave PIC Flex cooktop so you don’t have to go through the annoying ritual many homeowners go through of having to sort through their pots and pans to find an item that works optimally on an induction cooktop. True to its mission of delivering easy portability and value, this set features a cooktop that enables users to precisely control temperature settings. This not only helps you generate the right amount of heat when you need it and direct it where it needs to go, the quick heating properties of the cooktop and the high conduction qualities of the cookware ensure optimal cooking times. Faster cooking times lead to lower utility bills. Also, its single induction pad design ensures targeted high heat which reduces your overall electricity consumption-leading to even greater savings. When you start out with this package, you might be a recent graduate moving in to your first independent residence. You might also be a couple who is moving from city to city in search of better employment opportunities. Whatever your precise situation may be, buying this set actually gives you lots of flexibility and long term use value. You get to use high quality induction cookware immediately. Even if you settle down and move to your permanent home or buy a house, this set still delivers solid value because you don’t have to buy a portable induction cooktop-you only need to hang on to the NuWave unit this set includes. You save on having to buy an induction cooktop when you hit the road for a family vacation. While you may have upgraded to a formal range or heavy duty home range, your portable cooktop needs have already been satisfied. Accordingly, both your short term and long term cooking needs are met by the same device-despite the fact that your needs changed once you bought a home or settled down and got a formal or large cooking range. In addition to per unit value, this set’s cookware pieces are no slouches-featuring non-stick surfaces and lightweight form make them great cookware to use when you’re out on the road or moving from residence to residence. One dimension of versatility is your ability to cook wherever you find yourself. You only need an electrical socket for the cooktop that ships with this set and you can safely and efficiently cook food on the road. Even if you don’t have access to a wall socket, you only need to plug the NuWave cooktop to a solar- or generator-based power source and you’re good to go. This is all made possible by the small form factor of the NuWave cooktop. Light, small, and easy to use, you are assured of a source of reliable high heat so you can use your induction cookware wherever you find yourself. As long as you can find an electric plug for the cooktop, you are assured of some reliable induction heat with this set. Whether you are cooking fondue, frying, heating meat on a griddle, steaming veggies or dim sum or other steamed foods or making soup, this set has the versatility, easy set up, and convenience you’re looking for. In the event you want to cook on standard electric or gas ranges, this set’s cookware performs as well as as on the NuWave cooktop. You get to cook with confidence regardless of whatever range or power source is available to you. This further bolsters the main value this induction set was designed to deliver: maximum portability. You only need a wet sponge to wipe down the cooktop for optimal cleanliness. No need for scratching or burning through lots of elbow grease. Likewise, the cookware this set ships with are very easy to clean. This package’s cookware has a high quality non-stick surface that makes cleanup a breeze. Just wipe down with a soapy sponge, run them under cold running water from your faucet, and you’re done. Completely hassle- and drama-free. 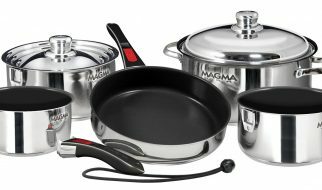 Given this set’s focus on portability and the high probability you’ll be using this in conjunction with your main cooktop or range, the periodic use of this set (regardless of how heavy at first) paves the way for possibly many years’ worth of solid induction cooking action. Thanks to its cooktop, its light weight, and its ability to cook a wide range of foods on the road, this package delivers solid value that doesn’t come with sticker shock.